MSTzilla: This one has indeed been stolen. Thanks to all who took on this challenging series. DO NOT GO TO THE POSTED COORDINATES! You would get very wet indeed. The coordinates given are not the ones you'll need, you have to seek them out elsewhere by doing a series of caches. The task will not be a simple one as it will take you to 6 different counties and 2 states. There is no time limit, so enjoy the caching along the way. The difficultly and terrain are not for this cache alone, but for the entire series. The cache is just off a trail with no steep hills. Once you find the 12 caches, you will find parking close by to this bonus cache. The area is open from dawn to dusk. Due to the nature of this cache and the likelyhood that it will not be found with regularity, I'm asking that you NOT place any trackables (travel bugs, geocoins, tags etc.) in this cache. This cache is the final or bonus of a 13 cache series celebrating my favorite television show, "Mystery Science Theater 3000." The first 12 in the series are stand alone letterbox hybrids that will contain a single number and letter combination that can be used to find the last, Bonus cache. You can do however many you'd like, but you'll need to do them all to get this lucky 13th. All caches are custom built and painted and contain a handmade stamp. I hope that you have as much fun finding them as I've had making them. As with all letterboxes, return the stamp to the container for all to use. Many of the containers could be a little fragile, so please take your time retrieving them. Anyone completing the series will earn "Honorary MiSTie" status and be listed on this page. The cache itself is intened to be a DVD exchange...but not just any movies. It's the hope that you will trade really bad movies in keeping with the premise of the show. 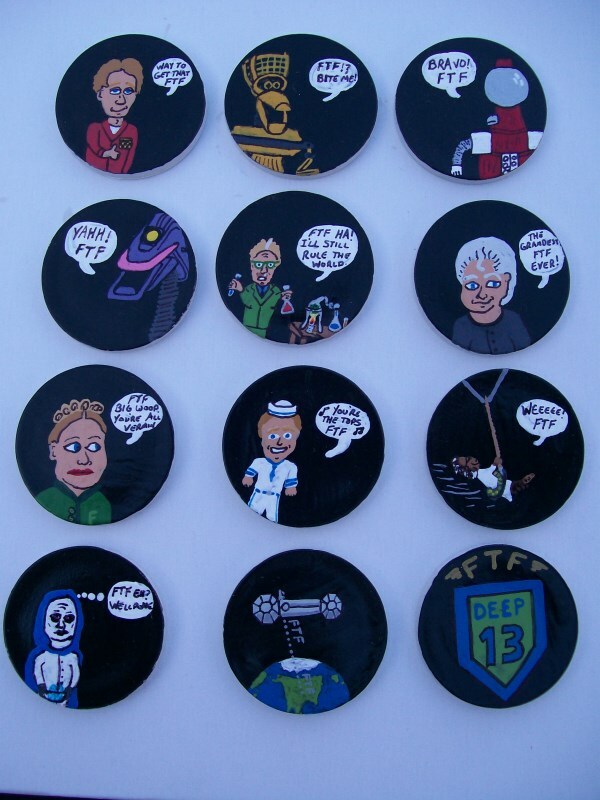 FTF will get, in addition to the hand painted token, a new copy of "Mystery Science Theater 3000 the Movie." Good luck to you all. Congratulations to Los Nidos Hawks the first to complete the series to earn FTF bragging rights and Honorary MiSTie status! Huzzah! Jbhyq V oevat lbh guvf sne gb fghzc lbh?! MSTies of the World, Unite!